Image caption Tha sreath de choinneamhan de bhòrd ChalMac gan cumail anns na coimhearsnachdan a tha gam frithealadh leotha. 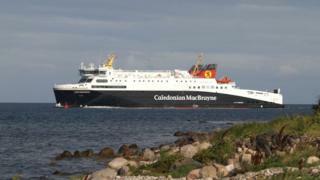 Tha a' chompanaidh aiseig CalMac air cuireadh a thoirt do luchd-gnothachais eileanach a dhol gu breacaist leotha ann an Steòrnabhagh Diciadain. Tha mòran ghearanan air a bhith ann thar na h-ùine a dh'fhalbh mun ìre de sheirbheis a tha ri fhaighinn leis a' bhàta an MV Loch Seaforth, mar a tha mu chuid de shlighean eile ChalMac cuideachd. Tha bòrd ChalMac a' cumail sreath de choinneamhan anns na coimhearsnachdan a tha gam frithealadh leotha. A rèir na companaidh tha iad seo a' leigeil leis na stiùirichean aca eòlas fhaighinn air na trioblaidean ris a bheil iad a' dèiligeadh.